You know what Election Day needs? Humor. Yes, as anxiety inducing and serious as the presidential election can be, something has go to give. So, it's probably a good thing that one particular talk show host had the wherewithal to provide us with some balance. If you didn't know, Stephen Colbert's Live Election Night Democracy's Series Finale: Who's Going To Clean Up This Sh*t? is airing at 11pm EST, and it's probably best you get a glass of wine and tune in so you can deal. And you'll probably want to know who the celebrity guests on Stephen Colbert's live Election special are. You know, just so you can know who you'll be drinking with. Before we get into the who's who of this viewing party, it's probably best detail some of the inner workings of the special. As per Deadline, Showtime, where the special will air, explains that the comedian will deliver an opening monologue that will stream on Facebook Live, but to watch the full episode you'll have to tune in on TV. They make sure to note that it'll be "uncensored," too. 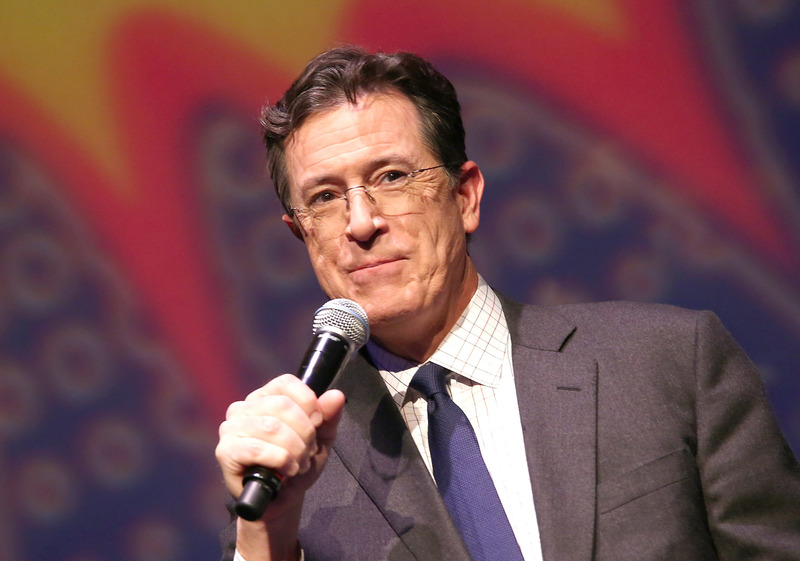 But Colbert Report fans are no stranger to Colbert's political monologues are we? Of course not. Though, given the title of this special, it may just be the most emotionally charged one we've seen yet. Or, at the very least, the most prolific speech to date. Don't worry, I haven't forgotten about the guests of the special, who are also subsequently the guests of your wine night. I hope you've bought enough cheese and alcohol for everyone, because there are quite a few people to entertain. To start, Deadline lists Katy Perry, Jeff Goldblum, Patton Oswalt, and Laura Benanti as guests. In addition to those stars, you'll see Jena Friedman, Nick Offerman (aka Ron Swanson himself), Larry Wilmore, and The Circus stars, Mark Halperin, John Heilemann, and Mark McKinnon will be there, too. The Hollywood Reporter relays that Elle King and Charlamagne Tha God are set to grace us and Colbert with their presences, as well. Honestly, I don't know how we got this lucky, but I'm not questioning it. There's no telling if we'll be feeling lucky again for a long while after it, you know?